The educational potential of games has captured the ongoing interest of scholars and educators who have sought to understand when, how, and under what conditions games support the teaching and learning process. General knowledge of how games support literacy, scientific thinking, or social learning has been theorized and researched, but some applications of game-based learning remain unexplored. 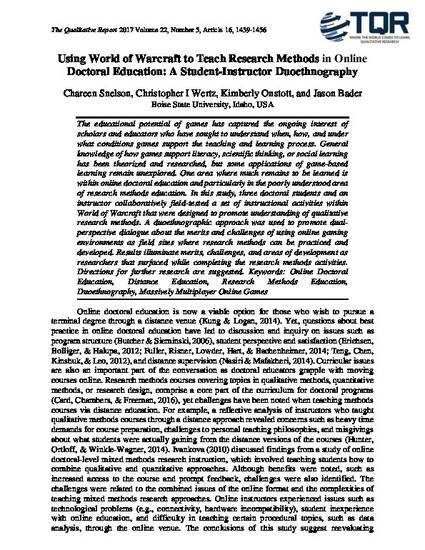 One area where much remains to be learned is within online doctoral education and particularly in the poorly understood area of research methods education. In this study, three doctoral students and an instructor collaboratively fieldtested a set of instructional activities within World of Warcraft that were designed to promote understanding of qualitative research methods. A duoethnographic approach was used to promote dual-perspective dialogue about the merits and challenges of using online gaming environments as field sites where research methods can be practiced and developed. Results illuminate merits, challenges, and areas of development as researchers that surfaced while completing the research methods activities. Directions for further research are suggested. This document was originally published in The Qualitative Report by The Qualitative Report. This work is provided under a Creative Commons Attribution-Noncommercial-Share Alike 4.0 license. Details regarding the use of this work can be found at: http://creativecommons.org/licenses/by-nc-sa/4.0/.